Meditation and mindfulness are buzz words nowadays. Be in the moment, stay in the moment, be present, wasn’t I present enough before? As far as I remember, I have been suffering from depression. It didn’t start with my PhD. Graduate school made it worse At the end of my second year, summer 2017, I reached one of my lowest points. I failed my annual review exam, I was breaking up from a difficult and toxic relationship, I had to move out from my old house and move to another lab. The situation was really bad and I was seriously thinking of dropping out from the programme. Despite the anxiety, I was wise enough to reach out to the counselling service at the University and took a break to visit my family in Italy. At that time, my new housemate who became my new boyfriend after a few weeks, told me about meditation as a way to treat depression. He taught me this technique called transcendental meditation, in which you repeat a word in your mind for 20 minutes. I noticed a quick improvement in my sleeping and breathing but the effect was short. Unfortunately, after all that happened in the first year of my PhD, I had lost all my confidence and passion for my research and I struggling a lot with being focused on the lab activities. I used to blame myself for every single mistake and all the things that went wrong. I struggled to balance my life, being a good student in the lab, having a social life, being a good girlfriend and I wasn’t taking care of myself at all. I reached out to the counselling service again and I then decided to start taking medication. I was initially on a low dose and after 6 months of taking meds, anxiety was still there and I went back to my initial and depressed state. I decided to double my dose of meds and I have been feeling much better since. Although medication helps in reestablishing serotonin levels in your brain, they aren’t a long term solution. I had no intention to keep increasing my dose and rely on meds forever, I needed a more permanent solution. Luckily, my social media presence helped me reaching out to loads of brilliant and like-minded people. I am glad of all the conversation about self-care, meditation and mindfulness because all the little things suggested have been making a significant difference in my life. I started by sticking to a self-care routine which means making myself presentable every morning, go out once a month, making nice meals, reading books and walking a lot. I do yoga 3 times every week and I practise it early in the morning so that I don’t feel the pressure of leaving the lab before 6pm while everyone else is still working. 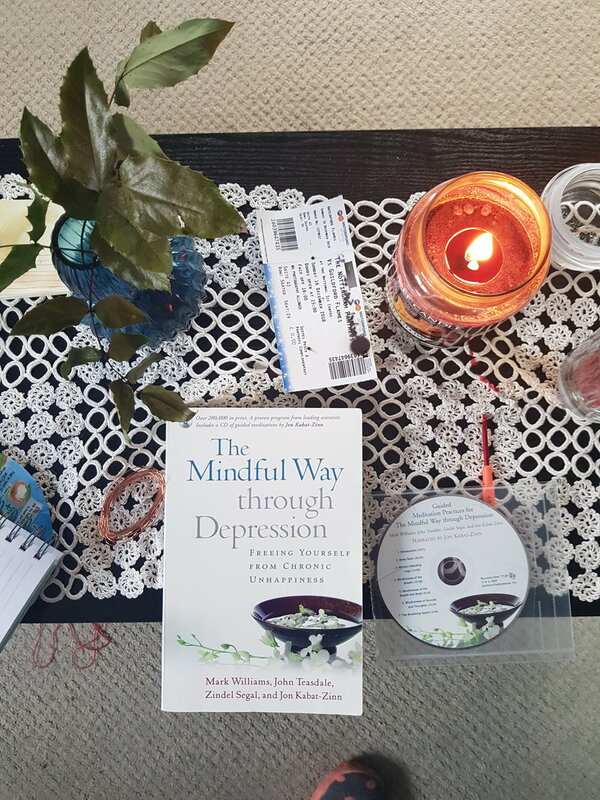 But the best thing happened recently is reading the book, “The Mindful Way through Depression," a guide through mindful meditation. It taught me to accept my experience present and past no matter how pleasant or unpleasant some situations or feelings can be. It taught me how to breathe with my pain, that the way I feel is the way I feel and this is okay. It taught how not to be judgmental with myself and look at thoughts as mental events rather than being carried away by emotions and sensations triggered by these thoughts. The best part is that you don’t have to stay seated or doing anything special, mindfulness is something you should apply to every activities of your life. Brushing your teeth, walking to work, watching TV, talking to a friend or a stranger, whatever you do, do it with intention and stay present in the moment. Care about it by noticing all emotions, feelings, thoughts and sensation related to a specific action. Practising meditation every day really improved my mood, I am a lot calmer and focused at work, I enjoy the lab and every moment of my life. I accept and live my experience moment by moment, breath by breath. I was back in Italy for a few days over Christmas and my family was surprised to see how different I was. No longer stressed, snappy, anxious, aggressive, complacent, not fun to be around with. I think of life and my job as a gift, not a burden anymore. Thanks to all the awesome people who directly or indirectly join this journey starting from Susanna, Prasha, Katherine, the people behind some of my favorite Instagram accounts @ph_d_epression, @herstemstory and @grad_selfcare. All my Instagram friends that despite don’t talk about this are a massive support, my friends in Nottingham and Italy and all those who constantly send me messages of support, because it really means a lot!